As the title just above shows, Guildford Model Railway Group's next exhibition layout is based on Goulburn. The real station is located on the Main Southern railway line 224 kilometres from Sydney by rail. 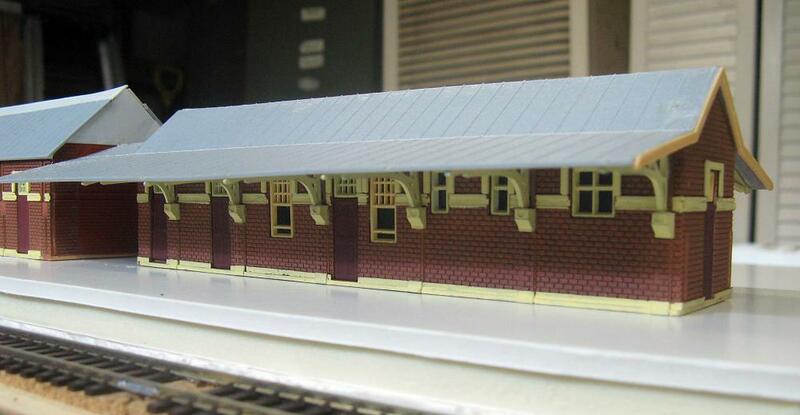 The railway at Goulburn is a very large enterprise and the area in particular that we are choosing to model includes the goods shed and the station as the two main features. For those more familiar with the area, this section is roughly from the Blackshaw Rd level crossing located north of the station to the Braidwood Rd road overbridge located south of the station. 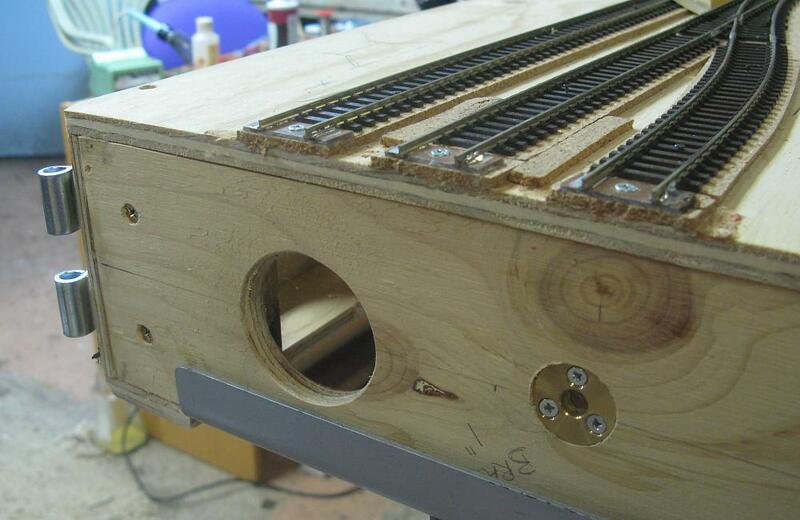 As mentioned in the last update, pattern maker's dowels and loose-pin hinges align and hold the modules together. In this view of one of the front modules, the female half of a brass pattern maker's dowel pair can be seen flush-mounted into the module end. One part of a loose-pin hinge set has been screwed into the module side. 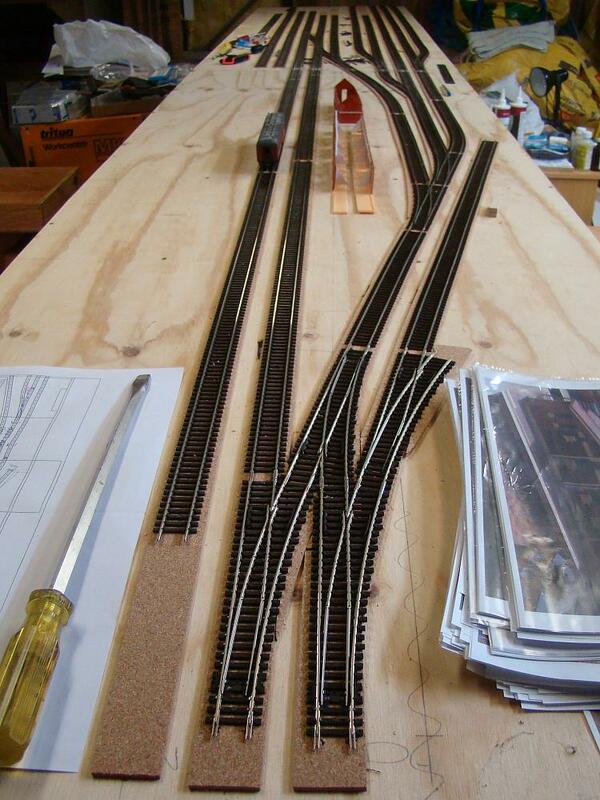 After a short break during the Christmas and New Year period, work on the new layout ramped up again during January 2014. Most work in this time has focused on the station area, in particular the island platform and its buildings. Before work on the station buildings continued, track was laid across the module join and onto the other front module. Here the two front modules are joined together with all the track laid for this stage of work. A plan of the station module is visible to the left, while on the right is a stack of printouts of photographs taken at Goulburn. The island platform has been roughed into place using sheets of Foamcore board. This has the advantage of being very light yet giving us the levels we need to achieve the correct platform height. To reduce weight, sections of the plywood module top were cut out and replaced with Foamcore board in the main station building area. The removal of this timber lightened the module by 2.1 kilograms. The main island platform buildings are comprised of a single story structure, and a structure that is part single storey and part 2-storey. There is a short breezeway in between these two buildings, with a continuous covered platform awning on both sides. We have used the AMRI Suburban Station kit as the basis for these buildings, kit-bashing several of these kits into the structure and configuration that we need. A new razor saw, sharp snap-blade knives, a file, sandpaper, a steel rule and a small square are all essential equipment. The walls were cut up into pieces to achieve the set out of windows and doors to match the prototype. They were easily reassembled and fixed using MEK. Styrene splicing was also used on the back / inside of all wall joints for extra strength. Front view of the island platform buildings. Various thicknesses of white Foamcore board has been cut and glued down to form the platform itself. The buildings have been placed in their approximate positions as a test. 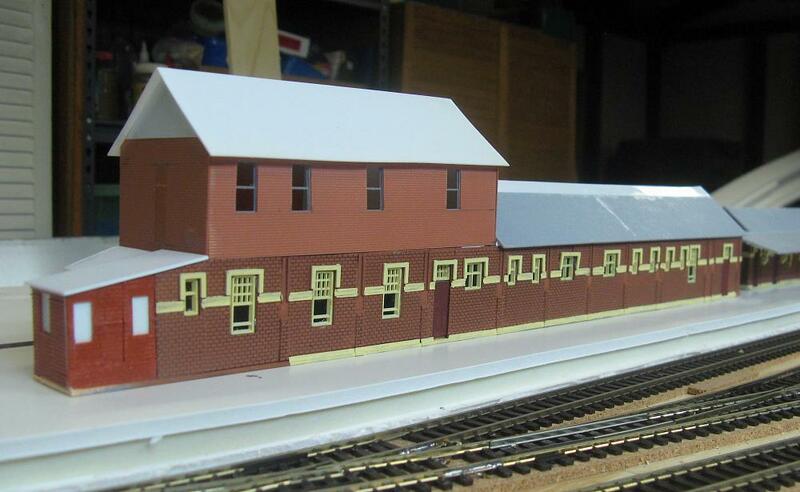 The platform awning and brackets are still to be added for much of the length of this building. The pencil next to the mainline track gives an approximate size reference for the building. All components were painted with an airbrush prior to assembly. The walls were given a coat of mid-brown to represent the brickwork, windows and awning brackets cream, and doors burgundy. Clear plastic for the windows was painted black on the inside surface to represent closed up and disused rooms. The cream-painted awning support corbels and brackets were glued onto the walls with Selleys contact cement. The 2-storey part of the structure was built using Slaters brick sheet, with Tichy windows glued into cut-outs in the brick sheet. The roofs from the AMRI kits were cut and glued on also with contact cement. Additional styrene splicing and bracing and some infill pieces were also added as required and fixed with MEK. View of the 2-storey part of the island platform buildings. 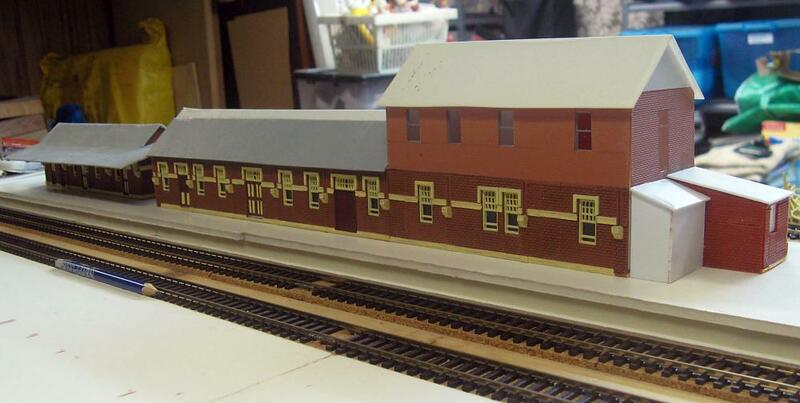 The ground floor part was built using parts from the AMRI Suburban Station kit while the top floor has been scratchbuilt using plastic brick sheet and Tichy windows. The corbels to support the awning brackets and the brackets and the awning itself are still to be added. We want to finish off the buildings as much as possible before we fix them down to the platform. It is so much easier to work on them on the workbench where they can be tipped, turned, or up-ended however we want to gain better access to all parts of the buildings. Work on these buildings will continue into February before we fix them down and move onto construction of the other smaller buildings on this platform. The single storey island platform building. This structure is almost complete although corrugated iron roof sheeting is still to be added to the awnings and roofs.